On a chilly December evening, 65 guests celebrated the holidays by enjoying our annual Compeer Holiday Party. 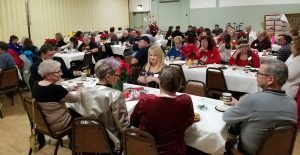 White tablecloths and large poinsettias decorated the tables, and everyone received a deck of playing cards as a little gift. Guests enjoyed a delicious feast of roast turkey, mashed potatoes, vegetables, and holiday cookies. Conversation around out tables was joyous and noisy! Many of our friendship matches come out on this special night to celebrate the holidays together; our unmatched clients appreciate the chance to socialize with their Compeer friends. 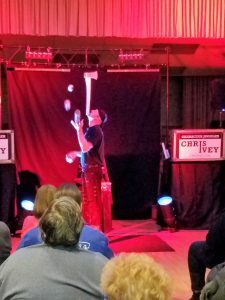 Though a few guests left early to beat the coming snowstorm that would deliver a couple of inches of fluffy white overnight, most guests stayed to enjoy the return entertainment of character juggler, Chris Ivey, who wowed our friends last year. 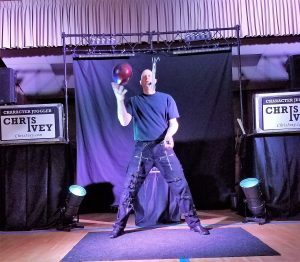 Mr. Ivey’s performance included plenty of audience participation and lots of laughter: he’s a bit of a stand-up comedian, too. 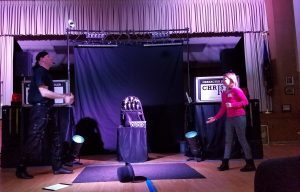 Guests were thrilled to watch him juggle knives, swords, and even a bowling ball! 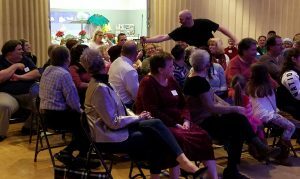 Compeer would like to thank the Area Agency on Aging for allowing us to use their space for our socials throughout the year. 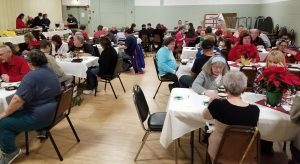 We are also grateful for our supporters who helped make this wonderful holiday experience a reality for our clients and their volunteer friends: The United Way of Lebanon County; The County of Lebanon (MH/ID/EI); Brentwood Industries; PA LINK to Aging and Disability Resources; and The Visiting Nurses Association.